We all want to firm up those tummies before hitting the surf this summer, but there’s much more to getting bikini-ready than just stopping by your favorite spin class three times a week. For all the hard work you put in at the gym, you’ll want to do the same in the kitchen with good nutrition at mealtime to maximize your results. Here are our top nutrition tips for slimming down and staying lean in time for summer, courtesy of Jenny Champion, registered dietitian and founder of Paleo Barbie. To trim down in the weeks just before summer, look for fruits and veggies in season, such as asparagus, artichokes, grapefruit and strawberries, says Champion. These low-calorie, high-fiber foods promote bowel health and a feeling of fullness. Additionally, asparagus is a natural diuretic which helps to shed excess water weight, while strawberries are high in vitamin C and antioxidants that help your body stay healthy while you’re working to slim down. Grapefruit is another vitamin C powerhouse which can help lower cholesterol levels and may, according to some research, aid in weight loss. “An inexpensive nutrition insurance policy,” according to the Harvard School of Public Health, a daily multivitamin will help make sure your body’s getting all of the daily minerals and nutrients it needs by filling in the gaps you may not be getting from your food. If you live in a cool climate and don’t get much natural sunlight, Champion also recommends taking Vitamin D3 (ask your doctor about the recommended dosage). As long as you regularly fill your plate with salads, grilled veggies and fresh fruits, you don’t have to deny yourself entirely. Go ahead and treat yourself to small portions of your favorite high-calorie foods and sweets. Champion also recommends pairing carbohydrates with both fats and protein to ensure maximum satiety; think tortilla chips with guacamole or pasta salad with grilled chicken and corn on the cob. You’ll get to your goal weight faster if you cut out the fried foods and switch to baking, broiling and steaming instead. 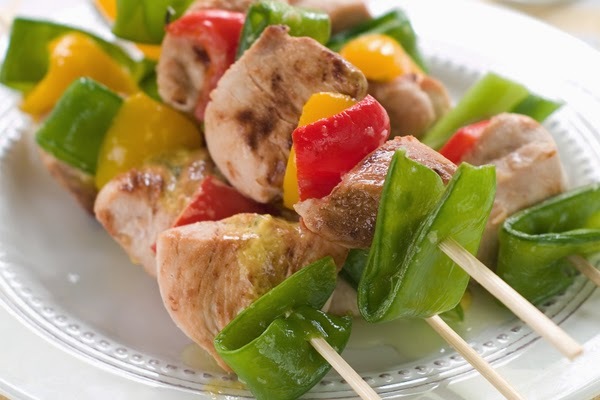 Now that grilling season is here, take advantage of it by putting kebabs, shrimp, veggies, lean chicken breasts and even fruit on the barbecue for easy meals. Slim your foods down even more by opting for fresh herbs over sugary or fatty sauces, says Champion.